We are a leading Manufacturer of foldable canteen table, stainless steel foldable dining table and ss canteen folding dining table from Pune, India. We are a distinguished organization, which is engaged in manufacturing and supplying excellent quality Foldable canteen Table. These tables are manufactured by our experts using finest quality steel, which is procured from the certified vendors of the market. Further, clients can avail these cafeteria tables from us in various dimensions, styles the other specifications as per their choice. 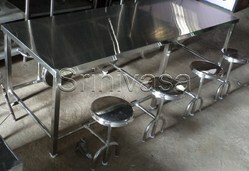 We are the manufacturer of Stainless Steel Foldable Dining Table to our customers.